Metablogger Doc Searls votes Liberal, bets Conservative, and in both dimensions picks Howard Dean to win the presidential campaign in 2004. “The hyperlinked underdogs are going to subvert the isolated overdogs every time,” Doc forecast in our conversation this afternoon. The only real question is whether the citizenry will be effectively networked by the end of next year. But even now, Doc said, the Web is the place to find the action and passion of the 2004 race, and the best information on it. Doc Searls’ bet on Dean sounds like an extension of The Cluetrain Manifesto and the famous Searls marketing mantras therein, starting with “markets are conversations.” Furthermore, “hyperlinks subvert hierarchy,” the book argued. And “networked markets get smarter faster than most companies,” or, in this case, than the richest campaign organizations. “I don’t see Kerry in the networked world,” he said. Or much of George W. Bush either, for that matter, though a “wartime president” with some smart and militant blog lances is harder to dismiss. 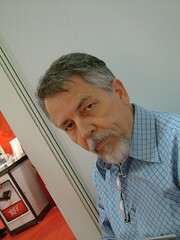 I was looking to the genial Doc Searls for clues to network building. And I was eager to admire him for the intuitive leaps–the diagnostic imagination–of his own celebrated pages. He is a news and radio guy who has graduated, by acclamation, to guru standing; but I see Doc in a white coat, with a medicine bag. Blogs are his scope on the soul and spirit of the country. He said his own blog feels more like prophecy than commentary. He is trying to see where the country is going. He thinks, as I do, that the blog boom and the war in Iraq are somehow entwined. Blogs were far the best forum for argument in the run-up to war–far better than Congress, say, or the newspapers, not to mention network television. Glenn Reynolds of Instapundit reminded Doc at moments of the Catch-22 character, the former mail clerk PFC Wintergreen, who seemed mysteriously to be running World War 2. The “blog-guard,” notably Reynolds and Andrew Sullivan, “defined the war,” Doc Searls observed. But the left-out opposition is finding its feet and growing everyday in the sorry aftermath. The Internet, in any event, “is becoming the Commons on which democracy depends. We’ve always needed this Commons, and now we have it.” Listen in. Posted by lydondev on Monday, July 21, 2003, at 11:09 pm. Filed under Uncategorized. Follow any responses to this post with its comments RSS feed. Both comments and trackbacks are currently closed. Thanks, Chris for Doc’s interview. His blog serves as a model, at least for me, on how to utilize this agreement/space whatever you want to call, most effectively. I think blogs are at their weakest, and I’m guilty of this when they try to be predictive and oracular. It’s the hardest thing to pull off, but it stimulates nonetheless. Without getting too political let me suggest that we begin to look at the US populace online as a resource for finding creative solutions for the current set of problems. Instead of waiting for the “government listening to RSS feeds” we can begin to try to reach a consensus through debate about issues regarding healthcare, resolution in Iraq, homeland security. Don’t you think that the blogosphere can work more efficiently in synthesizing information toward coming up with solutions than the government bureacracy can? Afterall, we’re not burdened by the onslaught of lobbyists, special interest groups or the need to get re-elected. To a great extent the gov’t should expect its citizens to work to find the solutions, now that they have the tools to network. (Just as newspapers must look to the Web see what people consider newsworthy. )I don’t think it’s so important that political candidates start blogging, but that they realize that the citizenry can share in the role of leadership. We love our heirarchies, they’re simple to comprehend and diagram, but there’s no reason to believe that creative solutions should drop down from the isolated, centralized bodies that are elected every 4 years or so. The blogosphere is a mess and imperfect, but protean, which is it’s real value. Chris – please interview a non-blogger. An open letter to Chris Lydon (posted here as a “comment” and over at my blog. Yet another great interview with Doc Searls. I learned a lot from the interview even though I got to meet Doc in person at Dave’s Cafe Bombay meet-up after Jupiter’s Business Weblog event. But you have to start interviewing non-bloggers. Up to this point, you’ve been “preaching to the choir” with Winer, Cone, Searls, etc. May I suggest that you take your BlogRadio portable studio over to the Harvard’s Kennedy School of Management and find out what their thoughts are on blogging, the web and Election 2004. A good start might be Matthew Hindman, a fellow over at KSG, who has gotten a couple of op-ed pieces in the NY Times recently. He wrote a piece entitled How the Web Will Change Campaigns <> back in Dec. 2002 in which he concluded that candidate websites would not be a deciding factor or even a significant factor in election 2004. Given that Dean now leads the Democratic pack in fund raising and his primary fundraising channel is his website, I wonder whether Mr. Hindman has modified his opinion. If Matthew is in town, you might invite him to the next “Thurs. at Berkman meeting.” We might even try to record the meeting for BlogRadio although I realize this might be a little ambitious at this stage. But, hell, you have to try a group interview at some point, right? Just desire to say your article is as surprising. The clearness in your post is simply nice and i could assume you are an expert on this subject. Fine with your permission allow me to grab your RSS feed to keep up to date with forthcoming post. Thanks a million and please continue the rewarding work. Hi I am so thrilled I found your blog page, I really found you by mistake, while I was searching on Digg for something else, Anyways I am here now and would just like to say thanks for a incredible post and a all round thrilling blog (I also love the theme/design), I don’t have time to read through it all at the minute but I have bookmarked it and also added in your RSS feeds, so when I have time I will be back to read a lot more, Please do keep up the fantastic job. Do you have a spam issue on this blog; I also am a blogger, and I was curious about your situation; we have created some nice methods and we are looking to trade strategies with others, please shoot me an email if interested.